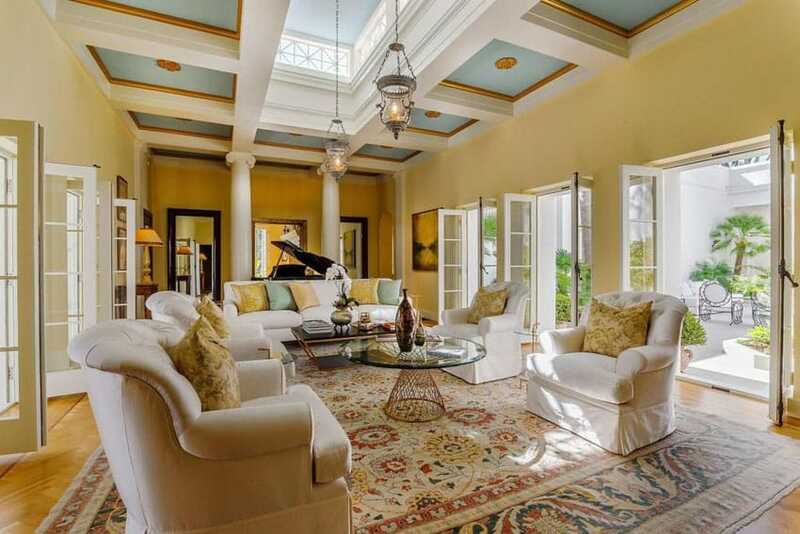 This gallery showcases beautifully decorated living rooms from a wide range of design styles. The living room is one of the most often used places in the house. These pictures feature designs using different patterns, furniture, colors and decor to provide inspiration and ideas to help you create your ultimate living room. 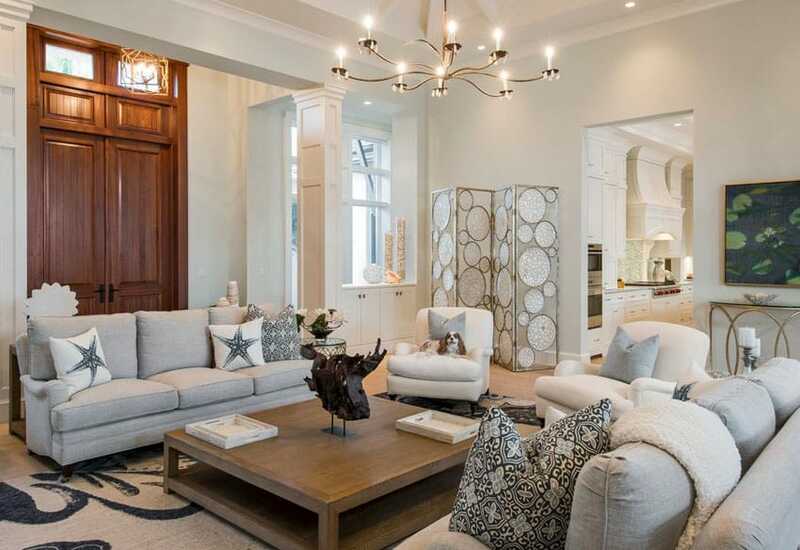 This white decorated living room design exudes contemporary style and aesthetic. The pristine white leather furniture is an intelligent design choice; the white leather tufted daybed, the mid-century modern sofa, and the white leather arm chairs go well with the materials and textures of the room. 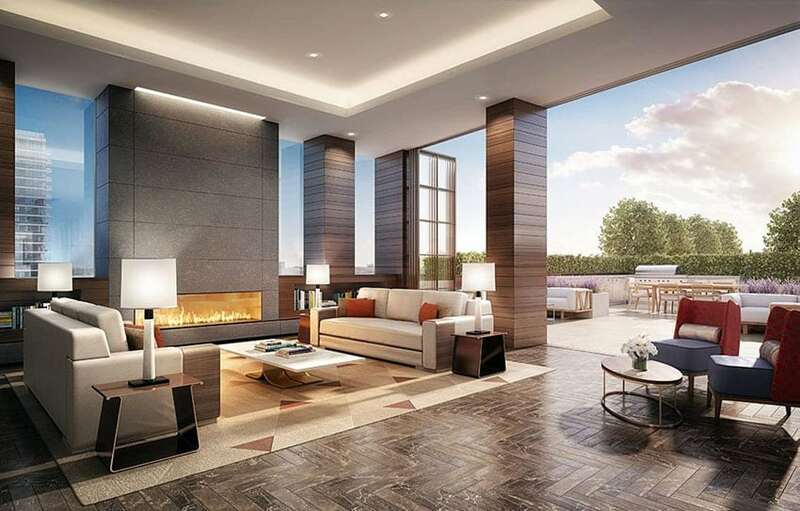 The dark brown polished stone tile wall cladding is used to accent the main wall of the space and draws the focus of the room towards the contemporary wood-burning fireplace. Grey granite floor tiles keep the area feeling edgy while the white area rug matches the white of the furniture and the rest of the walls. Rich warmth and bright light mix together in this high-rise apartment decorated living room example. The polished oak wood floors and wainscot use dark browns that are paralleled by the browns of the minimalist couches and stylish armchair. The accent wall employs a dark ash gray colored tile cladding to house the mid-height rectangular gas fireplace. The room also uses its view of the city buildings outside to its fullest by employing tall glass windows that bring in light and gives users a good vista of the outside. The open plan layout of this living room combines the floor area of the living with the adjacent dining room and kitchen. This gives all three rooms a more open feel. The open beams segmenting the ceiling give warmth and personality to the room by contrasting the light tans of the walls with its rich brown oak texture. The polished cherry flooring mirrors this contrast. The grey sectional couch and low-height lounge chairs are centered by the rustic minimalist wooden coffee table. 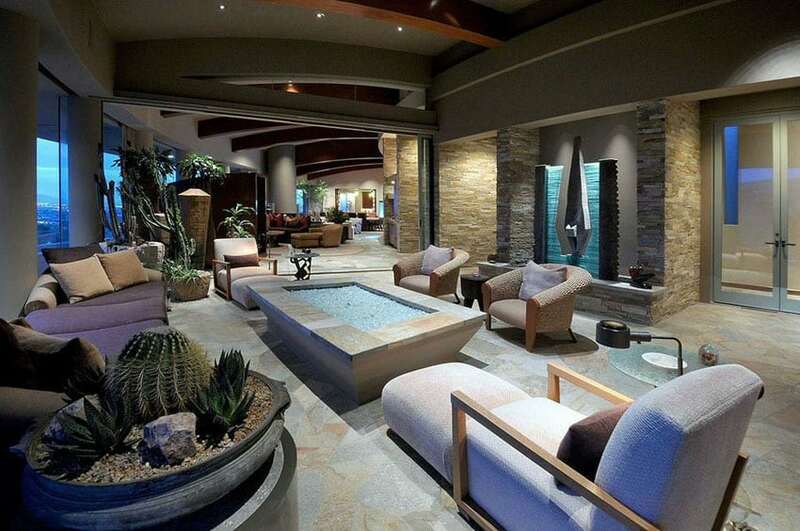 The woven area rug is a nice touch to the area. Interior design can also go the minimalist route with decorate living room designs. In this example, the design was kept simple, the select decor choices few, and the color palette minimalist. 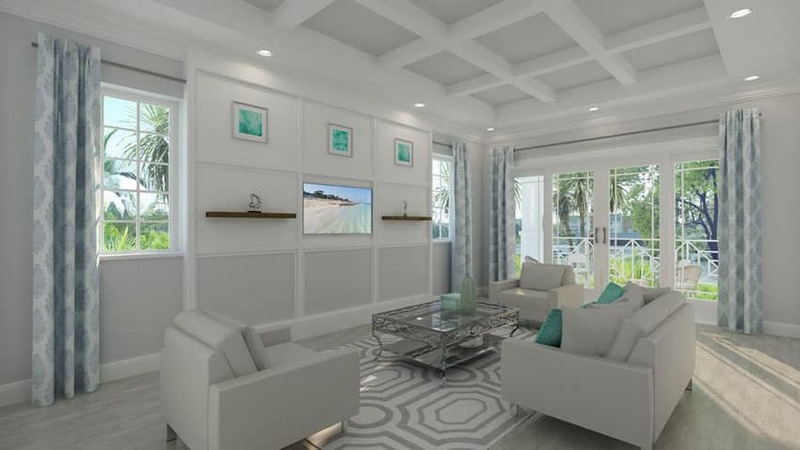 The pure white of the coffered ceiling, the white and light grays of the wall panels, and the soft beige of the ceramic floor tiles all serve as bold foundations for the overall feel of the room. The subtle but smart use of splashes of sea green on the wall paintings, curtains, tabletop decors, and throw pillows show stylish use of the accent color. The white leather modern lounge chairs and loveseat sofa go well with the white and gray area rug and glass and steel coffee table. 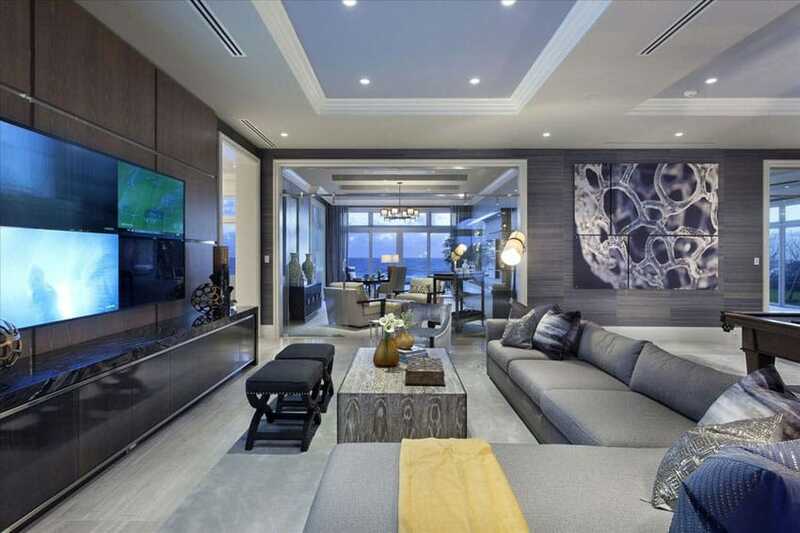 The ocean views of this living room are the coup de grâce of this space. The square limestone floor tiles are matched by the tan stone coffee table and the gray and white marble gas fireplace. The shaded chandelier graces the sophisticated coffered ceiling while the black stone shelving are bold design choices that adorn the walls of the space. The eclectic choice of furniture meanwhile give personality to the living room, with the snake skin pattern armchairs, the modern chaise lounge, and the Lawson-style sofa. Pristine pearl whites cover the entirety of this room. It keeps the space feeling pure, clean, and undeniably stylish. The tufted white leather sectional couch is the focal point of this space, with a design that is unique and pleasing to the eye. The white stone-top coffee table and knotted area rug go well with the white porcelain tiles of the floor. The choice of chrome ceiling fixtures in the ceiling fans as well as the pendant lights towards the back is also intelligent. Finally, the pure whites of the walls and cabinetry are only further complemented by the brightness that the french doors and windows provide. Certain accent design elements have a tendency to define a space. In this example, it is the lighting elements that do so: the contemporary pointed chandelier located at the center of the room, with a design that truly is a work of art, and the beautiful marbled fireplace and chimney cladding. The tan furniture and decor choices are also good choices for this space; the modern lounge chairs and sofa go well with the two-level solid wood coffee table. The dark browns of the accent walls, ceiling beams, and floor complement the whites and tans of the room. This cottage style living room uses a paneled accent wall, white mullioned clerestory windows and glass doors, and the white open beams of the hip roof to invite a feeling of brightness into the space. The subtle tans of the cherry floor boards, the solid wood coffee table and side tables, and the simple yet bold use of the low-height arm chairs and contemporary sofas all go well with the overall feel of the space. The open views to the pool patio outdoors further brings in aesthetic spaciousness to the space. The shades and dark colors of this contemporary living room aim to create a space that is both spacious and intimate. Its sophistication stems from the materials and finishes used – the slate floor tiles, the travertine wall cladding used on the accent walls, and the sophisticated dark grays of the rest of the space. 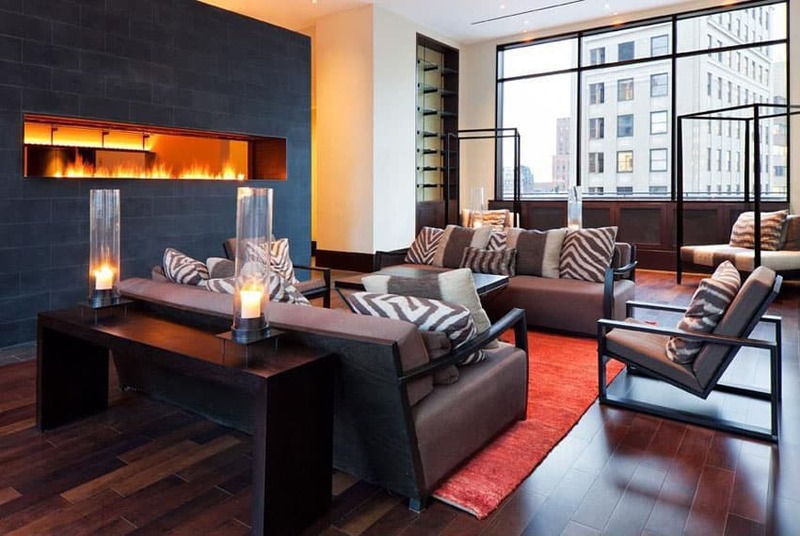 Different designer furniture is used in the space, seen it is unique designs for it chaise lounges, lounge accent chairs, and barrel arm chairs. The varied use of plant life as decor, coupled with great window views of the outdoors, keep the space feeling fresh and open. The art pieces displayed in the room give an unmatched air of sophistication and class. Cottage style living rooms such as this one have factors that define it as a space: they are cheerful, welcoming, and unpretentious. The rustic charm of the wood used in this space – seen in the solid wood square coffee table, the teak floors, and the wood plank front door – mixes well with the white paneled cabinetry and columns and painted walls. The contemporary brass chandelier has a design that is modern and sleek; this can be seen in the circle-patterned room divider and the metal-frame side table. The modern Lawson-style sofas, the low-arm white lounge chairs, and the black and tan patterned area rug are nice and appropriate choices of furniture. The brown and cream furniture define this open space living room. The light-colored ottomans and arm chair contrast the dark sectional couch. These seating furniture are matched accordingly by the solid wood coffee table and brown area rug. The dark gray porcelain floor tiles are also a nice touch and similarly also contrasted by the light colored and crown molded walls. 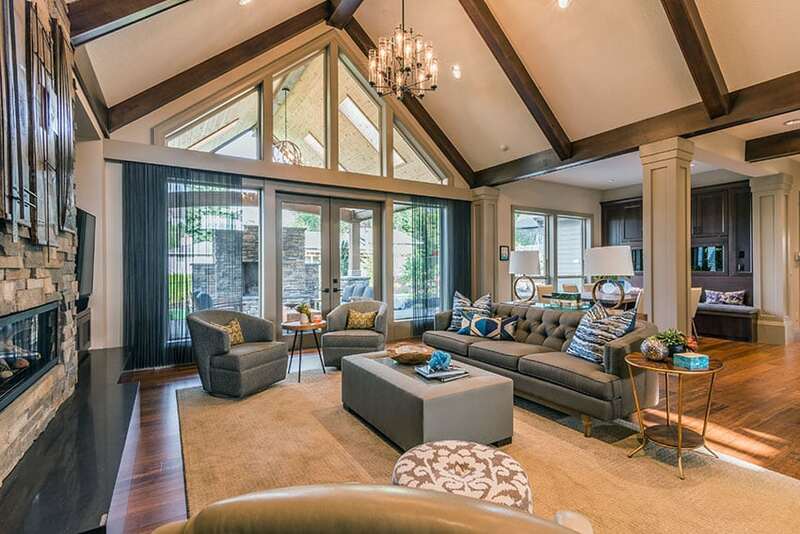 When executed correctly, high ceilings coupled with exposed roof trusses and open beams elevate the sophistication and class of a living room. It gives it a rustic charm almost unparalleled by any other ceiling design. The wood structural members of the ceiling are complemented by the richly furnished traditional aesthetic of the space – the English couches and lounge chairs, the wood-frame wing high back wing armchairs, and the rich mahogany coffee and side tables are excellent choices of furniture. The brown area rug is a good match for the granite tile flooring, and the rustic faded look of the tan wall paint serves as a good foundation for the design. Almost as if taken from an old black and white film, this living room design uses a very bold color palette choice in its design. Its charm stems from the smart use of a monochromatic palette on the contemporary couch and cantilever arm chairs. 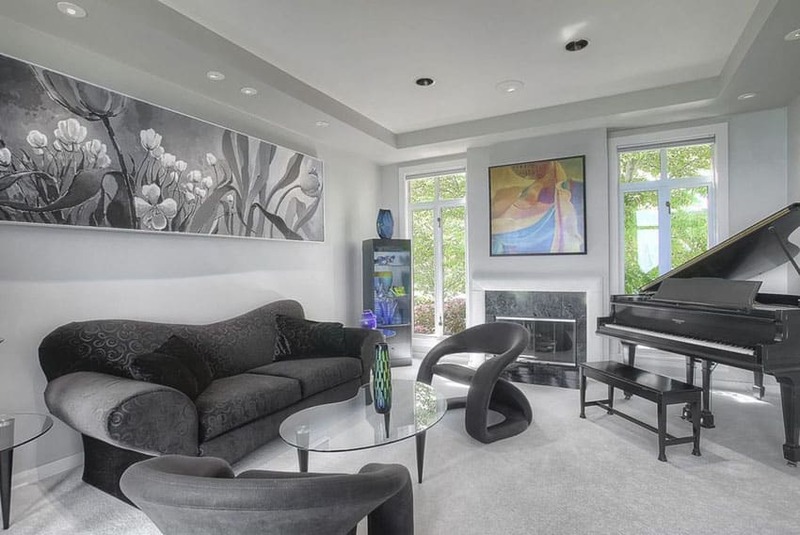 The glass coffee tables, the black and white painting on the back wall, and the black grand piano all follow the motif. Even the granite fireplace uses black stone speckled with white. With only minimal use of color seen in its decors and one painting, this stylish piece of design gives the user a sensual and bold lounging experience. Sometimes, opening up the second floor of a house is an exchange well worth the otherwise lost floor space for the second floor. 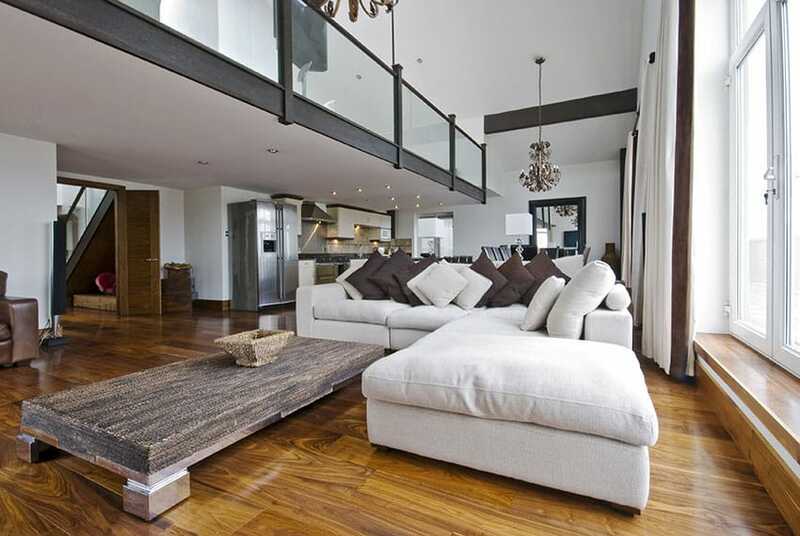 It provides a balcony view from the mezzanine floor as well as gives the floor below a high ceiling. Like in this example, it results in an openness and brightness that cannot be achieved by short ceiling heights. The brass chandeliers further accentuate the openness of the space. The rich grained mahogany floor boards and the different brown accents seen in the room are good partners to the whites of the section sofa, the walls and ceilings, as well as the full-length curtains and window frames. The large central wicker coffee table is a nice finishing touch to the room aesthetic. With polished marbled flooring such as this one, it is imperative to define certain floor areas so as to prevent the marble flooring from feeling too imposing. An stylish way to do so is with the use of contrasting area rugs such as the patterned one used here. The matching varnished cherry wood coffee table and console table give of a warmth that is much appreciated in this space. The English Lawson-style sofas use a gold-colored upholstery that matches the sophistication of the space. To further add even more grace to the living room, arched windows and doorways with full-length sheer curtains were used. Some designs mix rustic and clean in the same space. This creates a contrast between textured, varied elements and contemporary, bold ones. The slate tile accent wall as well as the various tones of the wood board floors act as stylish and loud textures. The contrast of those and the sleek, modern furniture – the contemporary mid-century modern white sofas, the glass coffee table, the looped area rug, and the solid white paint of the walls – create an attractive effect to the overall feel of the room. The lighting fixtures used are also interesting; the contemporary design of the chrome steel lights are welcome additions to the space. Brown and white are the colors that rule this living room space. 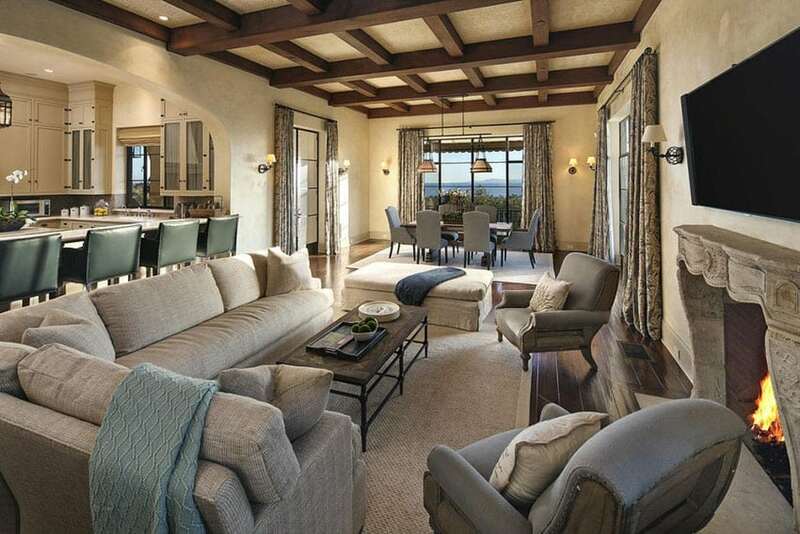 The whites of the walls, exposed beams, porcelain floors, and even the modern sofas and armchairs, contrast the browns of the wood board ceilings, dark stained coffee table, column trimmings, and throw pillows. The overall feel of the space, coupled with the arched doorways and large windows, keep it feeling fresh, open, and intimate. Generous use of plant life can really liven up a decorate living room. In this example, the house plants used for ornamentation, as well as the view of the outdoor garden greenery, really bring out the freshness and life of the space. The Lawson-style white sofa and the brown lounge chairs employ an earth tone palette that go well with the ornamental plants. The earthen tile flooring as well as the brown looped rug also help with the general ambiance of the space. 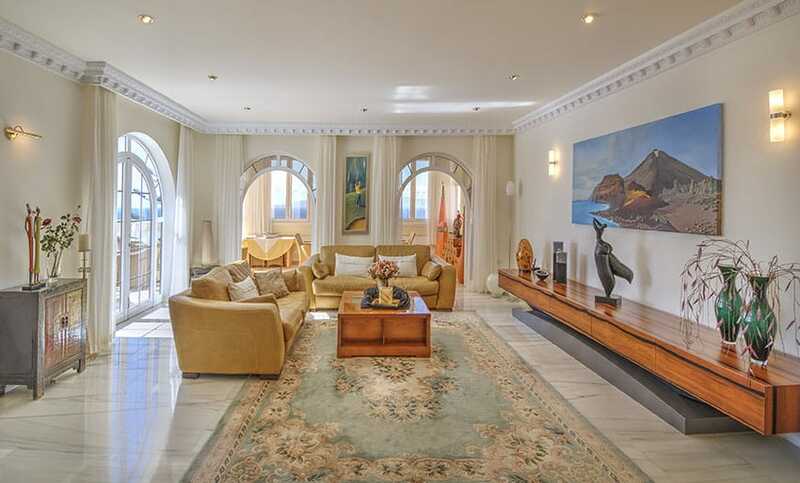 Elegant and traditional – two words one might describe a living room such as this. 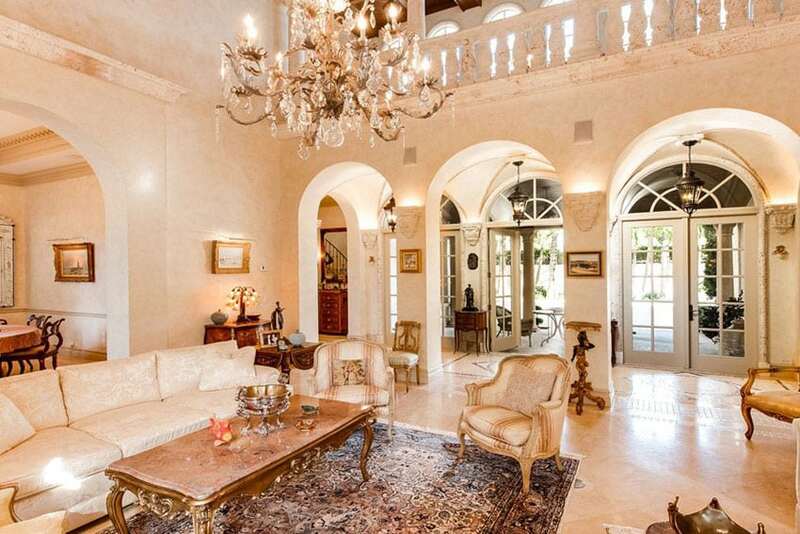 This classy piece of interior design employs arched doorways, a crystal chandelier, white granite wall cladding, and polished tan granite floors. The Victorian style furniture in the form of a large English sofa, camel back arm chairs, and a granite top coffee table all add to the grandiose ambiance of the space. The Persian rug, the subtle pieces of wall-hung art, and the views of the outdoors through the french doors give an extra touch of personality to the space. Built-in shelving nowadays are used more for ornamentation and space-definition than utility. The shelves here are painted white and adorned by books and knick-knacks definitely pleasing to the eye. The grey modern-style sofas and contemporary black leather ottomans make sure that the seating is just as stylish as the rest of the design elements in the space. 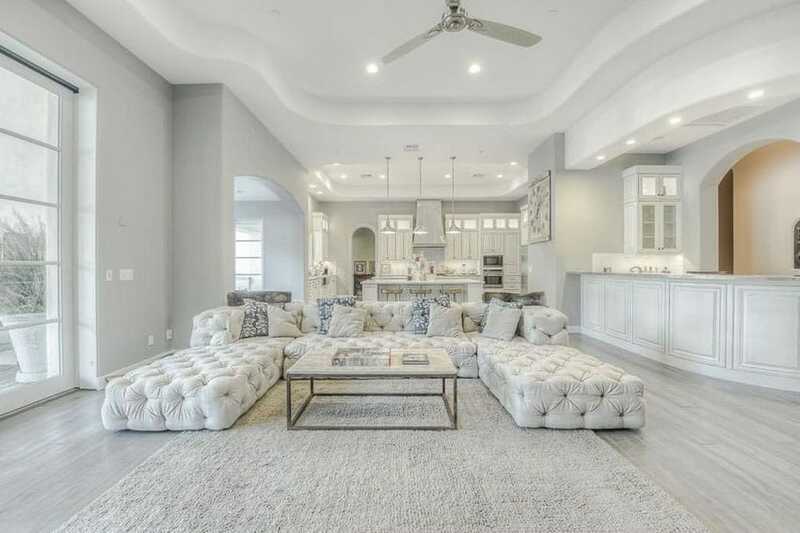 The white velvet area rug is a good contrast to the dark mahogany wood flooring; additionally, it also goes well with the whiteness of the walls and ceiling. The use of a tan granite fireplace and white-frame french doors and windows are nice finishing touches to the design. This glamorous and chic interior design piece uses saturated pinks, grays, and whites to create a color palette that is modernly stylish yet still classically elegant. The tufted tan leather contemporary take on the classic Chesterfield splendidly matches the colors of the wall panels and the ceiling. The crystal chandelier as well as the carved and gilded Rococo arm chairs give the room a traditional luxurious feel. This is further carried out by the faux fur carpet, the ash gray floor boards, and the frosted glass view doors. Open plans are common in high-end decorated living rooms – this gives much flexibility to the space and also provides spaciousness and light. The stacked stone wall of this living room uses varied textures of slate tiles to break the solidness of the rest of the room. The subtle fireplace used also provides functional and aesthetic warmth. The sleek modern styles of the yellow armchairs and white contemporary sofas are bold and simple. The tinted automated patio sliding doors give you a nice view of the outdoors while the clerestory windows also offer ambient views of the sky. 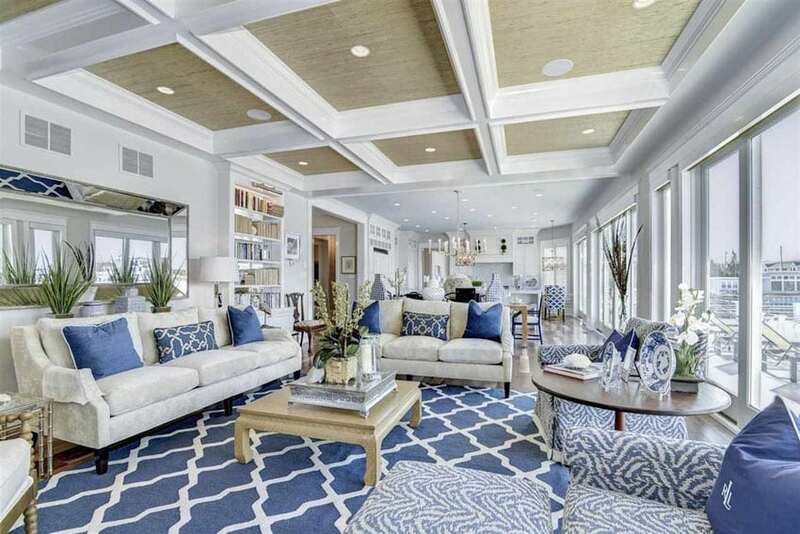 Blue and white color palettes are used for navy theme living rooms. The geometric patterns on the area rug, and throw cushions keep the space visually interesting and give a certain playful charm to the room. The microfiber upholstered sofas, the blue and white patterned arm chairs, and the various wooden side tables are good choices for this navy-theme space. 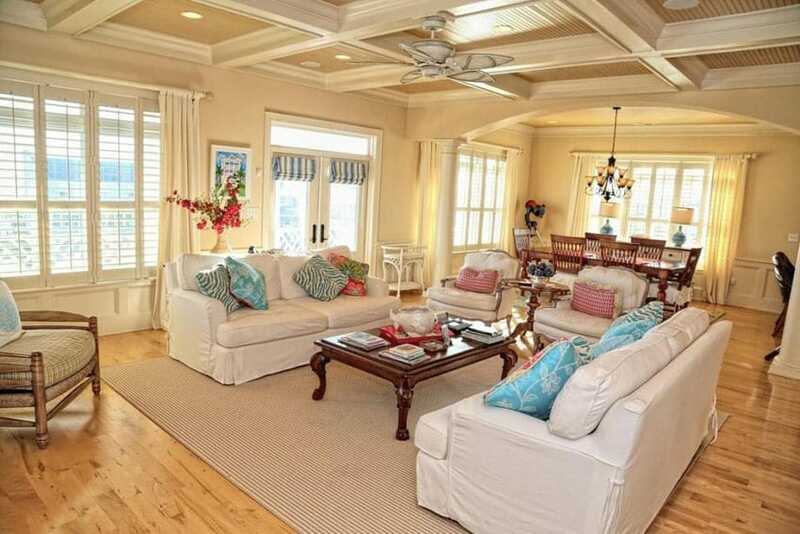 The coffered brown and white ceiling matches the solid wood of the floors. And the white walls bounce of the generous amount of sunlight coming in from the glass sliding doors that open up to the outdoor areas of the house. Vertical space has a powerful effect on how a room is made to feel. High ceilings and the incorporation of staircases and balconies to a living room make a space feel luxurious and stylish. The incorporation of a tall arched window with full-length draping curtains help further the cause. The English style seating furniture, the glass-top round coffee table, and the polished marble floor tiles all help make this space sophisticated and aesthetically pleasing. Cathedral ceilings are defined by their gable roof shapes, high ceilings, open beams, and clerestory windows. Examples such as this achieve an openness that define the space. The glass chandelier further decorates the white and brown ceiling. The slate tile accent wall houses a fireplace and rustic wall decor while the polished hardwood flooring is accented by the tan area rug and contemporary furniture. The grey central ottoman is surrounded by the grey barrel chairs and tufted gray mid-century modern sofa. Finally, the outer wall is adorned by view doors, high clerestory windows, and Venetian blinds; this lets in light as well as gives people clear views of the outside. Mediterranean style designs are suitable for mountain tops such as this one. This residence gives its living room amazing views of the outside with the use of large doorways to the outside balcony area. The stone fireplace that fronts the living room uses stacked stone as its cladding and has a large rustic, re-purposed clock decorate its surface. The brown leather ottoman is a nice touch and goes extremely well with the clay red lounge chairs and brown traditional cabriole sofa. 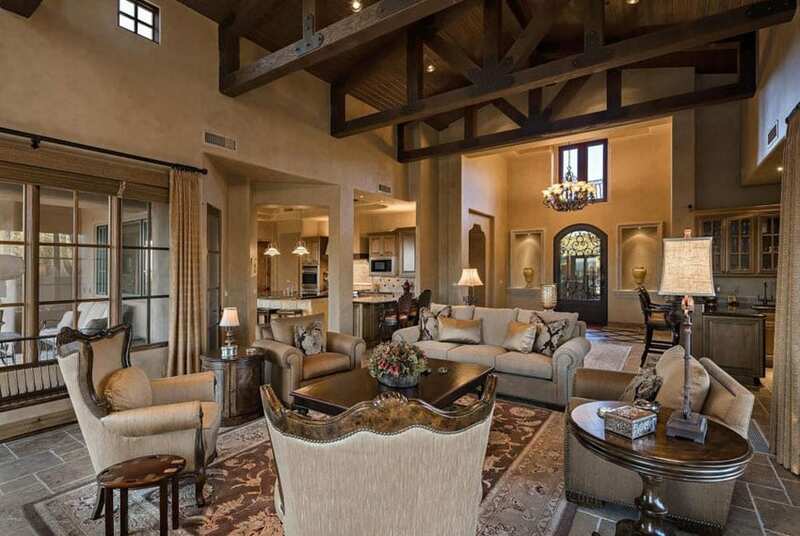 The dark brown area rug complements the varying hues and textures of the wooden floor boards. The exposed wooden beams of the high ceiling defines the area of the living room and the wrought iron chandelier is a nice touch. Traditional designs for living room commonly employ bright, happy color palettes to prevent being too imposing an area. The sunny combination of mustard yellow on the walls and parquet flooring and the light blue of the ceiling panels, with accents of white, keep this space feeling welcoming and light. The box ceiling has blue panels with gold accents that are a nice overall touch to the space. The central ceiling is raised and uses clerestory windows; the combination of these elements with the numerous french doors give the space an additional openness. The tan English sofa and arm chairs are good partners with the chosen floral rug and even employ throw cushions that use the yellow and blue color combination. This bright living room uses view doors and glass windows that almost encompass the whole length of the walls in this room to really let in the light. 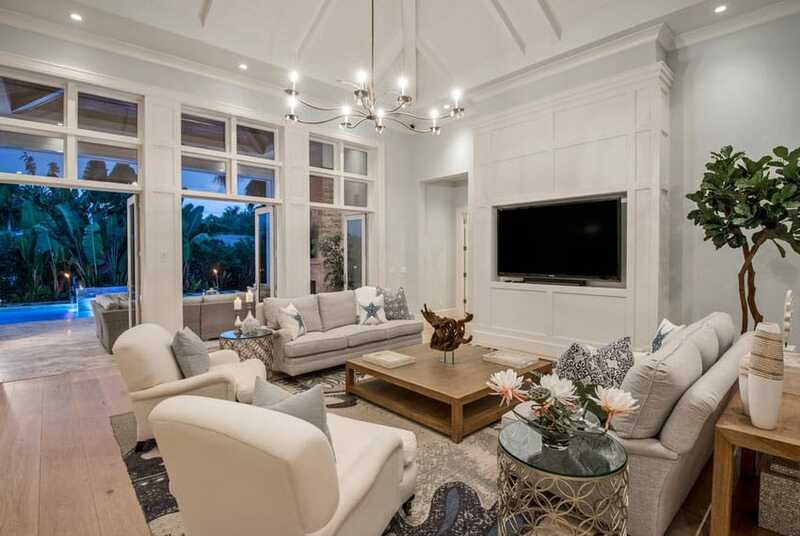 The rest of the room – the coffered white ceiling , the white marble stone flooring, and even the white motorized ceiling fan – further make the room brighter by employing a generous amount of white. The large sectional sofa, the wooden coffee table, and the tufted yarn area rug use browns to offset the general brightness of the space and serve as a good contrast. This cottage style living room does its job of being welcoming and cozy. 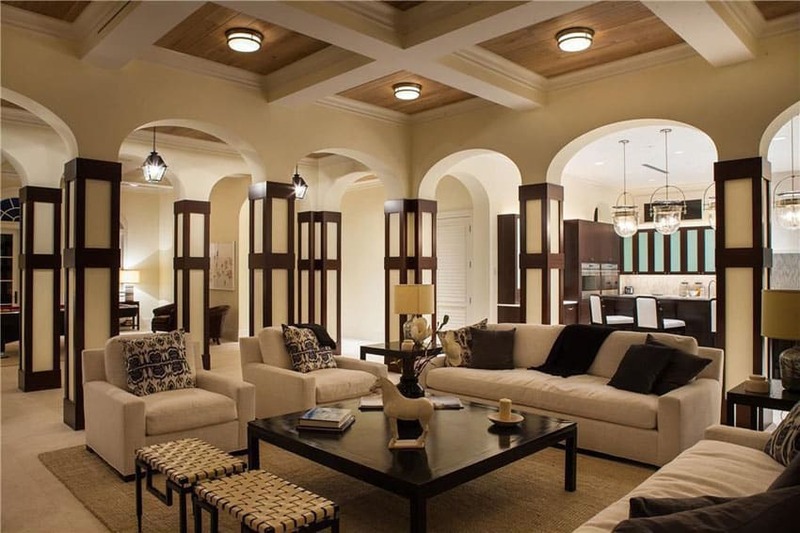 The motif of this decorated living room are contrasts of brown and white as well as the use of paneled segments on both the wooden ceiling and the columns. The soft curves of the arches are nice design elements that contrast the mostly linear elements of the room. The Belgian track arm sofas and Lawson-style arm chairs go well with the large dark brown coffee table and dark beige area rug. The travertine floor tiles are a nice touch. The gray color palette of this living room, seen in its painted walls, marble floor tiles, and tray ceiling, have a visual monotony that is broken and enhanced by the splashes of purple seen in the area rug and the red violet color of the throw cushions. The crystal chandelier also draws attention being as it contrasts with the contemporary style seen throughout the room. The armless lounge chairs, the quilted cabriole sofa, and the glass-top coffee table are smart choices for furniture. The curved archways are suitable to the high ceiling of the room and further keep the ambiance sophisticated and classy. 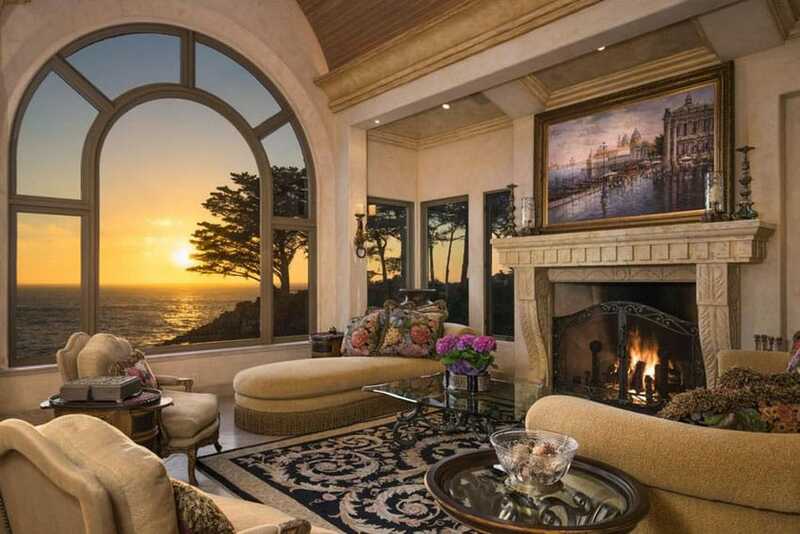 The main attraction of this living room is its large arched window, which provide a breath-taking vista of the sea and setting sun. The placement of the chaise lounge is also appropriate for anyone looking to appreciate the views of the outside. 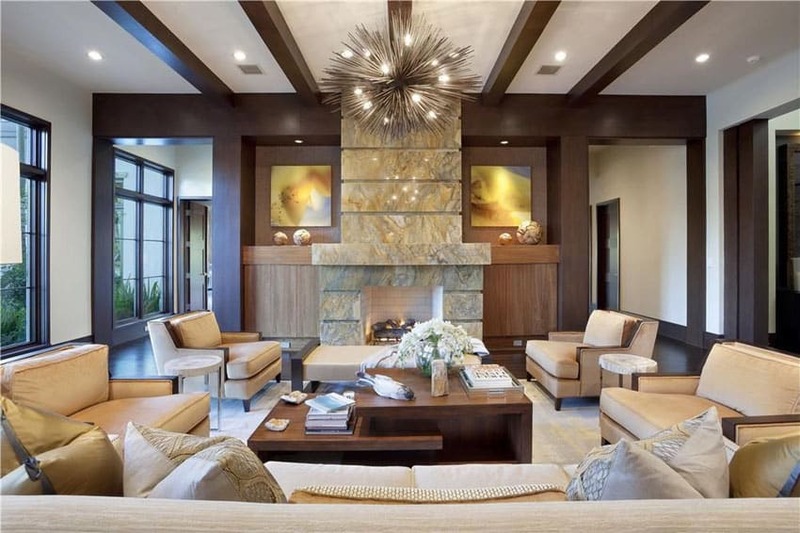 The tan walls match the stone wood-burning fireplace and gold accent on the ceiling moldings. The traditional sophistication of the arm chairs and cabriole sofa are accented by the black and white area rug and keep the place feeling high-end and luxurious. 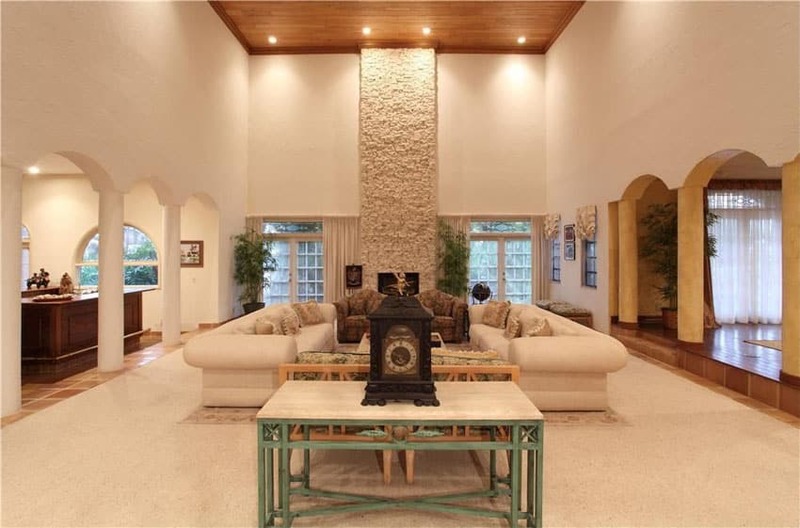 The clean and proper look of this living room is achieved by the more than generous amount of white seen in its stacked stone fireplace accent wall, the white painted square columns, and the white coffered ceilings. The subtle use of glass and mirrors as shelving and back walls is a nice touch. The smooth upholstered Lawson-style sofas math the circle coffee table and tufted area rug. The dark oak hardwood floors are the only touch of contrast for the whiteness of the room and serve as a nice visual break to prevent aesthetic monotony. Seaside residences almost always use full-length windows – and quite a number of them – to take advantage of the amazing views of the ocean outside. As such, high ceilings are needed to really have windows that maximize your views. The azure of the sea, in this example, is complemented by the whiteness of the painted walls, limestone flooring, and granite columns. The wing back armchairs, tufted white leather ottoman, and white contemporary sofa all go well with this design. 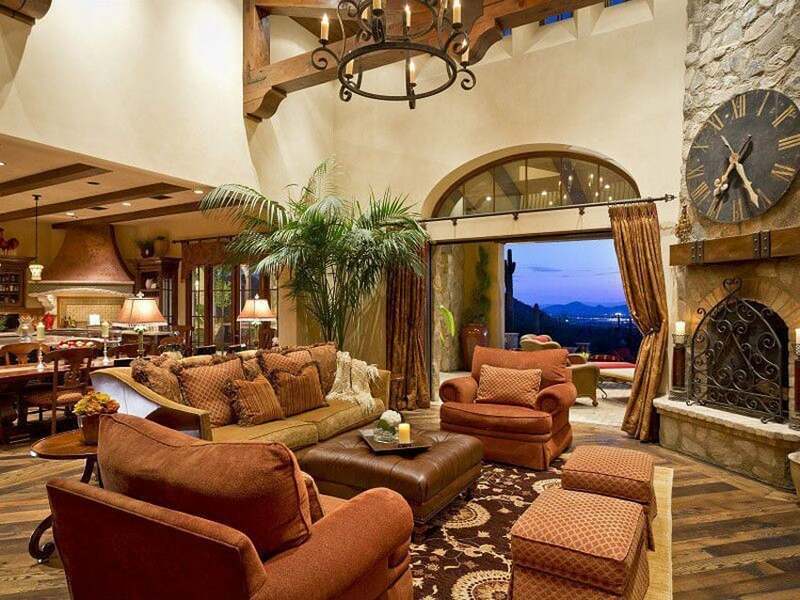 This luxury living room uses its corner layout and takes advantage of its two sides of outdoor walls by employing numerous french doors and view doors to let the light in as well as provide amazing vistas of the outdoor areas. 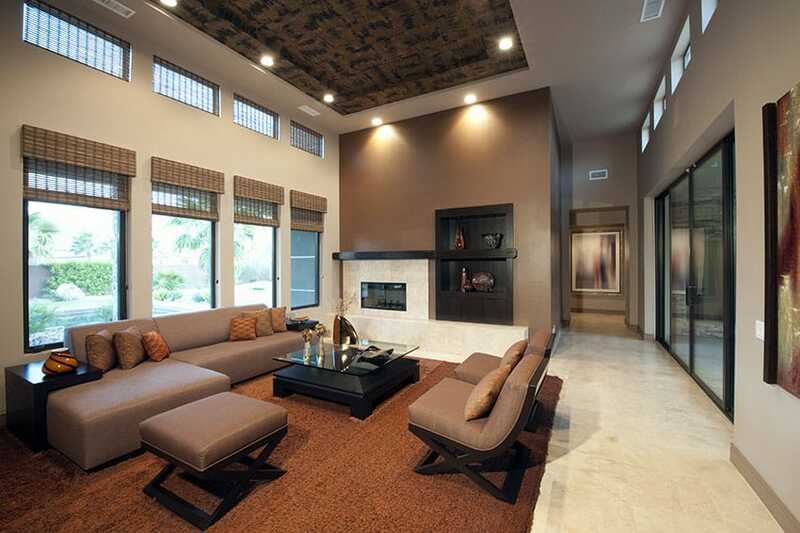 the fireplace, coffered ceiling, and chandelier are all elements that help give the space sophistication and class. The brown modern sofa, wood-arm lounge chairs, and chaise lounge match the area rug and shear curtains in the space. Ocean fronts truly make an ideal backdrop for any residence. 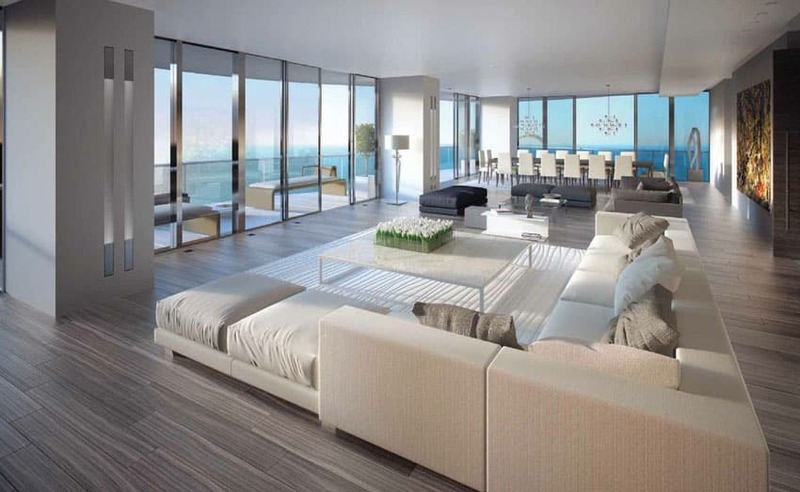 The wall to wall sliding door systems employed here maximize ocean views and lets tons of light into the space. The porcelain wood grain patterned floor tiles have a ash grey hue that goes well with the saturated, bold color palette of the walls and furniture. The large sectional couch with an equally large stone-top coffee table have a bright white color to them that really makes the living room feel inviting. That, coupled with amazing vistas of the outdoors, makes this space ideal for rest and relaxation. This modern example uses an eclectic variety of design elements to achieve an ambiance that is personal, lively, and stylish. The central fireplace is a bold yet beautiful design choice, with its metallic industrial look going well with the feel of the space. The white leather sectional couch, the glass top modern coffee table, the dark wood flooring, and the generous use of different style of windows keeps this living room feeling exciting and adventurous. Open plans are given a new meaning in designs like this, since this kind of living room quite literally “opens” up itself to the outdoor patio area. The retractable folding french doors go all the way from the floor to the ceiling to maximize the wall space that opens up. This modern living room uses faux woo porcelain tiles, a geometric pattern area rug, mid-century modern sofa chairs, and minimalist side tables and coffee tables to give off a classy, luxurious, contemporary feel. The high ceilings, wooden and stone-clad walls, the wide gas fireplace, and the cove lighting all make this space unique and undeniably stylish. Black and white furniture are always classically beautiful design choices that go well with almost any living room. The white sectional couch and black lounge chair and ottoman, in this case, seem to employ a minimalist modern approach to their aesthetic. This is further seen in the black and white shag area rug, white minimalist coffee table, the simple yet bold hung paintings, and the geometric architectural elements of the space – the walls, shelves, and ceilings. To balance this all off, teak floor boards were employed to give a little bit of warmth to the space and wide windows behind shear curtains also serve to give some light to the room. The ocean-views of designs such as this one are perfectly complemented by white and blue tone combinations. The white sectional couch, chaise lounge, and shag carpet are pleasantly accompanied by the blue ottoman, and purple full-length curtains. Other design element also give the space a traditional sophisticated feel, such as the crown molding of the tray ceiling and the chrome chandelier at the center of the room. This is a perfect example of letting a cozy and intimate space still feel open and spacious. The design incorporates numerous tall windows that line up almost the full length of the wall to give awe-inspiring views of the ocean outside. The white sofas and gray ottoman also help keep the room feeling light. The contrasts of the brown pillows and carpet floor give some amount of darkness to the space but that only serves to bring out the light even more. In this type of room, keeping it feeling aesthetically spacious is important due to the relative small floor space that is used up. Anything less than this and the design starts to feel cramped. This stone fireplace employs an uneven stone slate texture that commands the attention of the room. 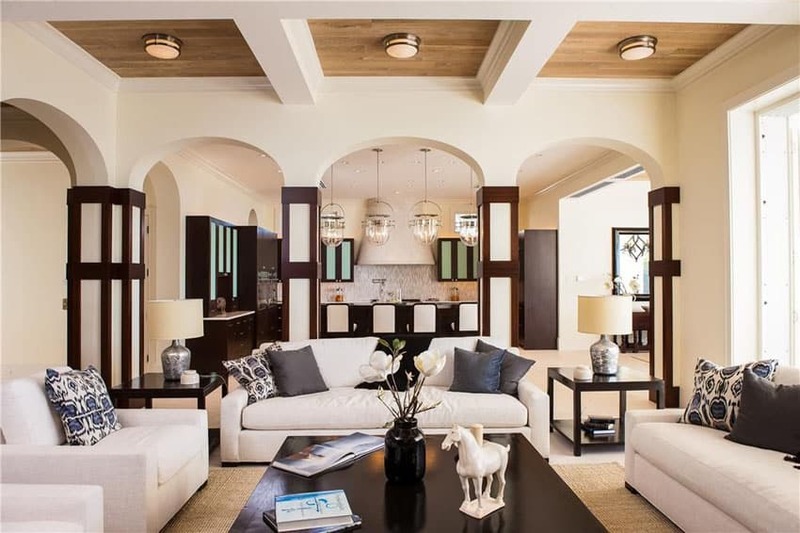 This is due to its stark contrast to the rest of the design elements in the space, with smooth plain white walls, curved archways, and pristine white carpet and cabriole sofas. The nice texture of the wooden slat ceiling is also a smart design choice. The french doors at the far end of the living room space let in a good amount of light while the house plants used as ornamentation help liven up the space. Beautifully decorated living rooms often use angles to achieve a consistent design theme. Stylish and minimalist is what one might describe this decorated living room. The solid white and browns of the walls perfectly match the geometric linear elements seen in the eye level windows and clerestory windows, the rectangular stone fireplace and wooden wall shelves, and the tray ceiling. Even the brown sectional sofa, armless lounge chairs, glass-top coffee table, and ottoman are geometric. The marble stone tiles and textured raised ceiling give subtle but pleasingly noticeable contrasts to the blocked minimalism of the space. 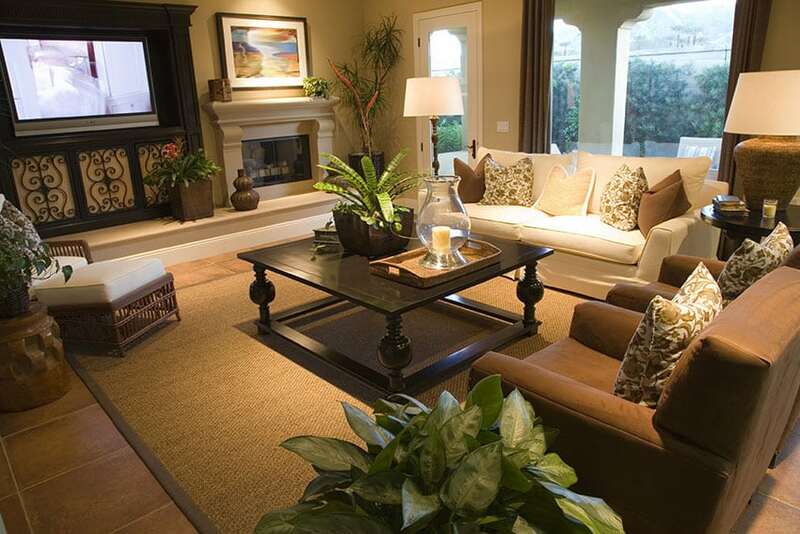 This more traditional design employs warm earth tones to keep the space feeling cozy and welcoming. The plantation shutters and white couches exude an almost Southern charm, while maintaining a coastal vibe through the use of whites and bright color decor. The wooden slat box ceilings and the wooden floor boards add some nice rustic ambiance to the space. Additionally, the other varnished wooden furniture – the coffee table, side table, and arm chairs – add some personality to the room. Decorated living rooms with built-in bookshelves are timeless and sought after by many homeowners today. This second floor living room space takes advantage of its wall spaces by utilizing white built-in bookshelves. The bookshelves not only serve a functional storage function but also uses the displayed books as room decor in and of themselves. The grey and white box ceiling and white walls meld nicely with the brown hardwood floors, area rug, and sectional couch. The wood-top coffee table gives off a nice industrial chic vibe that gives a nice contrast to the other design elements of the space. In this room the grays complement the blues in this example of contemporary living room styled design. The large grey sectional couch matches the porcelain tiles of the floor as well as the darker colored porcelain tiles of the walls. The large console table is smart and sleek design choice and matches the black ottomans located next to the solid wood gray ash coffee table. Finally, open layouts such as this one, coupled with large view doors showing the ocean views outside, are peerless in their openness and spaciousness.